Emma Bunton Attends Cars 2 Premiere With Her Boys! 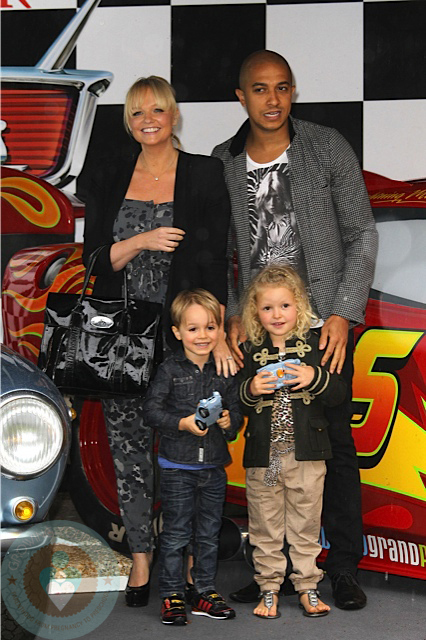 Home » Emma Bunton Attends Cars 2 Premiere With Her Boys! Emma Bunton was all smiles on Sunday as she walked the red carpet with her boys and a friend for the UK premiere of CARS 2. The new mom looked great in a grey printed jumper with a black blazer, while snuggling her little man. As cute as ever, Beau was decked out in Cars sneakers and a denim shirt and pants. Not in attendance was Jade and Emma’s new baby Tate. The new addition, who arrived in May, is too young to be a Cars fan yet. But we’re sure, like every child, he will catch on soon. Colin Farrell Smooches His Sweetie! One of my favourite celebrity families!!!!!! !